Comfortable. Good price for quality mattress. What do you get when you pair a 10-inch foam base with two inches on top of the finest, most lovingly cradling memory foam? This mattress, of course! In your choice of soft, medium, or firm support, it reduces the transfer of your co-sleeper's motion while mitigating sensitive pressure point pain ensuring that you get your fill of Zzzz's. I was moving from Boston to NYC and needed to have a mattress in the apartment my first night there. I had no other furniture that first night and at would never make it sleeping on the floor. The doorman in my new building was on vacation and I did not think I could execute delivery of a "real" mattress, especially where I know none of the neighbors and who might let delivery guys in if I had not arrived yet. I decided to look at the reviews on Overstock and try a moderately priced memory foam mattress that I would fit in my SUV and drive to NYC myself. I did not want an expensive one, just case I did not like it, knowing I could not return it once it was opened. The package arrived at my home in Boston and was a little taken back by that was delivered. It was a squished up rolled up giant blob wrapped in a very heavy plastic covering, within which there was a white plastic burlap bag that held the mattress. I thought "I will never get a good nights sleep on this thing." Well, I got the mattress to NYC (it is heavy, but with a dolly and an elevator, I was able to manage it on my own), and opened it in the apartment. It immediately popped open to nearly normal size. I fitted it into the bed frame and was very surprised that it looked with a "real" mattress. I did not notice any foam smell that other reviewers talked about. The mattress was expended to full size within about an hour. My first night on the mattress was awesome. I had never slept on a memory form mattress and I expected the worst. This mattress exceeded my expectations in terms of comfort and quality. My husband arrived the next night, and after his first night on it, he declared that he wants to order another for our second bedroom as it was so comfortable, and a great value for the price. The only complaint we have is that standard sheets seem a little short on the mattress and they don't quite make it neatly around the mattress. I am going to search for some sheets that are specifically for memory foam mattresses and maybe that will help. Overall, this mattress is a great value, and provides a great night's sleep. The free delivery and ability to fit it in an SUV without tying it to the roof made it the perfect choice for someone moving. I recommend this mattress 100%. Ok, STOP your mattress search. This mattress makes me want to go to bed at like 6PM! I have had the mattress for 5 days. Prior to this mattress, I purchased a Sealy memory foam mattress from Overstock. It was firm and I loved it. But it was time for me to move to a king, so I got this one. It comes vaccum packed. It is 98 lbs and although my fiance probably could've gotten it upstairs himself, it comes in a nylon bag, and is awkward to carry because of it's cylindrical shape. But the two of us got it up there, no problem. We placed it on our box spring and let it expand for 28 hours. We opened the windows and left it alone. The smell was minimal and I don't smell anything at all now. I purchased the medium firm. Somehow, it is still firm and supportive, but your body sinks in just enough. It is absolutely the best sleep I've had and I'm already a great sleeper. I've researched for weeks and am relieved and thrilled that I bought this one because it is just THAT GREAT. Most comfortable bed I've ever owned. I debated between 10 and 12 inch thickness. 12 inch was the right choice. Conforms to my body. Set up was easy. Allowed the mattress to air out for 2 days...no odor. I have had my mattress now for nearly a month and I feel like I am in heaven. I haven't gotten up in the morning sore since the first night I slept on this mattress. It is so comfortable! My husband likes firm and I like soft. We compromised and got the medium comfort and we are both happy. It was perfect. We had been looking at the $4,000 + mattresses in the stores but decided we would try this one before putting out that kind of money. We are so happy we did. You cannot go wrong with this mattress. As a recent college graduate without a bed, I was looking for a very soft, affordable, memory foam mattress and I found everything I wanted with this product. Like stated in other reviews, it came compressed and rolled up. After cutting it loose, it immediately fluffed up, and within 9 hours I slept on it without any problems. It probably did take a full 24 hours to full decompress, but I didn't notice any difference the first night. It did have a bit of a chemical smell on it, but I opened my window and turned on a fan and I didn't notice anything when I slept on it and I have a very sensitive nose. After reading the reviews, people seemed to be very torn over whether this mattress was firmer than advertised or softer. Since I know I wanted a very, very soft mattress, I went ahead and ordered the soft. My mattress is incredibly soft, conturing to every curve of my body. If you do not like a very soft mattress, I would probably go medium. This bed is incredibly soft, and yet it has a firm base so I don't feel like I'm sinking into quicksand when I lay down on it. I've had this bed for a week now, and I have literally never had a better nights sleep which is saying a lot as I just moved into a house with an infant that cries all night. I usually toss and turn all night long, but not on this bed. I'm comfortable all night and I wake up actually feeling refreshed and happy. I don't feel like it gets too hot like some other memory foam mattresses do, either. I can't stand to be hot while sleeping and I haven't noticed any problems at all. I'm sure that the quality of this mattress isn't exactly on par with temperpedic or some of the nicer brands, but at this price, you simply cannot find a better bed. It was exactly what I was looking for, and I'm extremely happy. My wife and I just moved cross country, so had tested out a couple dozen hotel mattresses on our journey, and this mattress is as nice as the best ones that we slept on during our trip. We got the "Very Firm" option, but the gel top layer is still very soft and gives you that "sinking in" feeling. The middle layer is very firm, but comfortable, and gives me the support that I really like for my back. I'm not a sleep or orthopedic expert, but this mattress has resulted in a significant reduction in my amount of daily back pain, and over three weeks I have not woken up once feeling like I "slept wrong" and have a kink in my neck or back. Definitely consider logistics when the mattress is delivered/unpacked, since it's just being dropped off by UPS, and very heavy. Only my wife was home to receive it, and thankfully, the UPS guy was very nice and helped her carry the 100lb package up to our second floor apartment. Two people are necessary to unpackage the mattress and put it in place since it is so compactly packaged and heavy. As other reviews point out, you need to wait for the mattress to expand, however ours took only a few hours... we were able to sleep on it that night. There was also a slight chemical odor that dissipated after the second day. 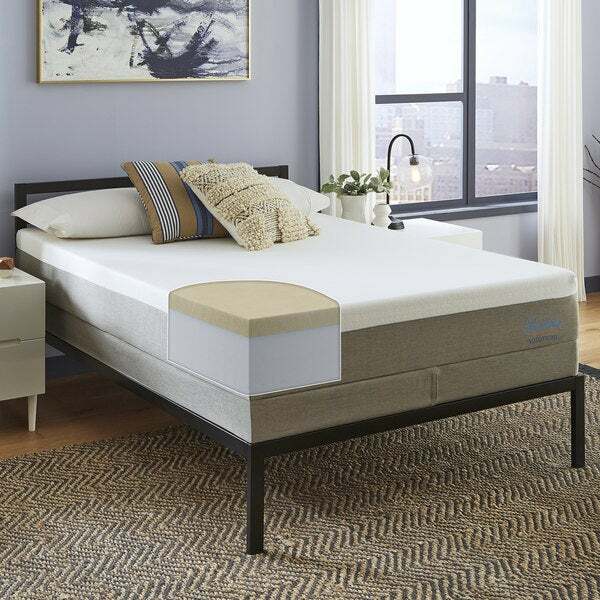 Overall, phenomenal mattress that my wife and I look forward to sleeping on every night and the price was great. Completely satisfied. Okay, soooooo....I'm one of those people that are a little skeptical about buying large item's on line....will it be worth it? I read the reviews and even like that I know that we are all so different, well I would like to agree with the other reviews....I feel very satisfied with my purchase. I'm only 35 but I have difficulty sleeping at night, I always woke up like if I had been in a fight the day before. Realizing that I needed a new matress I took my chances with this one and I am so happy that I did. For the price it's a great deal. I ordered the medium and still feel it's pretty soft but have no complaints..the packaging was exceptional. I read that others may have not liked the smell that these matresses have in the beginning but mine was fine...no overwhelming smell. Thank you overstock for saving our wallets. We could have blown all our money on a matress that was over a thousand dollars but I'm glad I found this steel on your website. This mattress is just what I hoped for, not too plush nor too firm. Filled out to 12 inches within a few hours! Purchased this mattress for a new platform bed. All things considered, a good product and value. Two things worth noting, however. First, it has a very strong chemical smell. It dissipates considerably over the first day but the residual lingers for about a week. As a result, I waited a few days before using the new mattress. You may want to air it out in a well ventilated space before getting rid of your old mattress. Second, I purchased the firm mattress but was surprised to find the top layer (maybe 2 inches) was actually quite soft. I've gotten used to it and it's comfortable, but I would have preferred if it was firm throughout. After trying several different "regular" mattresses, I deceided to try a memory foam. Several family members have purchased the "top of the line" memory foam and loved them. Since I live way out in the country, I really didn't have the option of trying one locally. My decision to try this one was based on reviews and turned out to be an excellent option. It has given me a great nights sleep and is probably the most comfortable mattress I've had. Would highly recommend. We went from a very expensive pillow top to this and couldn't be happier with the decision. We were initially hesitant to order a mattress online without laying on it, but the reviews helped and we figured that for the price, we would be happy if it lasted only a few years. It is completely worth every penny and we probably will order another one someday. We ordered the soft and it is the perfect combination of firmness and softness. We look forward to going to bed every night and wake up with a lot less aches and pains. I definitely would recommend this mattress, and have already told all of our friends about it. Totally worth it! Since this is my first memory foam mattress, I wasn't sure what density to order. I chose the medium firm, & think it might be a little too soft, since I have to fight it to turn over & get out of the bed. However with that being said, it does seem to support the body nicely. Have only been sleeping on it for less than a week, & am starting to sleep well using it. Great big bang for our buck! What a back-saver and a great deal - just the right amount of firmness and support - best mattress I have ever had! We purchased Slumber Solutions Essentials 12-inch Memory Foam Mattress some times ago and still working great. It has not deformed after regular use. Easy purchase & set up. Comfortable. Simple. Slumber solution essential 12 inch memory foam got it for my bedroom. Very nice I get nice sleep in it. Also it's not as he heavy as old fashion mettrases. I love it. So soft. We fell asleep the fastest on this bed. Woke up so refreshed. I am madly in LOVE with this mattress! Best ever! Bed still STINKS!!!! Waiting for it to outgas. Don't buy this if you need to use it immediately. Mine is sitting in a guest room waiting for it to be odor free now since December. I have had this mattress for 4 years and still love it. When I got it it filled out quickly and did not have a bad smell that some memory foam mattresses do. Great mattress for the price. I would recommend. High quality! Would definitely recommend. "Hello, I do love this mattress! Had it for a few years now. I desperately need to know what the fibers/ feathers are that are underneath to fabric that covers the foam (under the actual mattress cover) "
The inner cover is a fiberglass mesh textile. "What is the shipping weight of the queen 12 inch mattress? " The shipping weight is approximately 78 pounds. "We’re looking to replace our RV mattress, can the length be ct?" Any changes to this mattresses will void the warranty. We do not recommend cutting or altering the mattress in any way, as it can damage the structure of the foam. "Can this mattress be used with an adjustable bed frame?" It is in my opinion that this matteress could NOT be used with an adjustable bed frame. Reason being, it is too thick and firm. Excellent mattress needs solid base. Yes, this mattress can be used with an adjustable bed frame. However, we recommend using an 8-inch or 10-inch thickness for better performance results. "I've never had a foam mattress. I like a very firm mattress and am concerned that I will not find the foam mattress/firm option hard enough. "" Firmness preference is subjective. A soft might be too firm for some and firm may still be too soft for others. I find the medium firm to be firm. As an other reviewer stated, the mattress is not as firm when sitting on the edge however when sleeping it is plenty firm. As a note, it is much firmer then our pillow top Simmons at our other home. "Does it sleep hot or cool?" Memory foam can sleep a little warm. Look for our gel infused memory foam products which are designed to draw heat away from the body. "What happens if you wait longer than 72 hours before you open the box?" It is recommended to open the mattress within 72 hours for maximum expansion.